Insurrectionary anarchism is a revolutionary theory, practice and tendency within the anarchist movement that emphasizes insurrection within anarchist practice. It is critical of formal organizations such as labor unions and federations that are based on a political programme and periodic congresses. Instead, insurrectionary anarchists advocate informal organization and small affinity group based organization. Insurrectionary anarchists put value in attack, permanent class conflict and a refusal to negotiate or compromise with class enemies. Revolution and insurrection must not be looked upon as synonymous. The former consists in an overturning of conditions, of the established condition or status, the State or society, and is accordingly a political or social act; the latter has indeed for its unavoidable consequence a transformation of circumstances, yet does not start from it but from men's discontent with themselves, is not an armed rising, but a rising of individuals, a getting up, without regard to the arrangements that spring from it. The Revolution aimed at new arrangements; insurrection leads us no longer to let ourselves be arranged, but to arrange ourselves, and sets no glittering hopes on 'institutions'. It is not a fight against the established, since, if it prospers, the established collapses of itself; it is only a working forth of me out of the established. If I leave the established, it is dead and passes into decay. Now, as my object is not the overthrow of an established order but my elevation above it, my purpose and deed are not a political or social but (as directed toward myself and my ownness alone) an egoistic purpose and deed. Mikhail Bakunin "was historically important to the development of an anarchism that focused its force in insurrection. Unlike Marx, who built his support in the First International, mostly within the central executive structure, Bakunin worked to build support for co-ordinated action through autonomous insurrections at the base, especially in Southern Europe. And since Bakunin's time insurrectionary anarchists have been concentrated in Southern Europe." Later in 1876, at the Berne conference of the First International, "the Italian anarchist Errico Malatesta argued that the revolution "consists more of deeds than words", and that action was the most effective form of propaganda. In the bulletin of the Jura Federation he declared "the Italian federation believes that the insurrectional fact, destined to affirm socialist principles by deed, is the most efficacious means of propaganda." As anarcho-communism emerged in the mid 19th century it had an intense debate with Bakuninist collectivism and as such within the anarchist movement over participation in syndicalism and the workers movement as well as on other issues. So "In the theory of the revolution" of anarcho-communism as elaborated by Peter Kropotkin and others "it is the risen people who are the real agent and not the working class organised in the enterprise (the cells of the capitalist mode of production) and seeking to assert itself as labour power, as a more 'rational' industrial body or social brain (manager) than the employers." The Narodniks were a politically conscious movement of the Russian middle class in the 1860s and 1870s, some of whom became involved in revolutionary agitation against tsarism. Their ideology was known as Narodnichestvo (народничество), from the Russian народ, narod, "people, folk", so it is sometimes translated as "peopleism" or more commonly "populism". A common slogan among the Narodniks was "хождение в народ", khozhdeniye v narod, "going to the people". Though their movement achieved little in its own time, the Narodniks were in many ways the intellectual and political forebears of the socialist revolutionaries who went on to greatly influence Russian history in the 20th century. Narodnaya Volya's program contained the following demands: convocation of a Constituent Assembly (for designing a Constitution); introduction of universal suffrage; permanent people's representation, freedom of speech, press, and assembly; communal self-government; exchange of the permanent army with a people's volunteer corps; transfer of land to the people; gradual placement of the factories under the control of the workers; and granting oppressed peoples of the Russian Empire the right to self-determination. Narodnaya Volya's program was a mix of democratic and socialist reforms. Narodnaya Volya differed from its parent organization, the narodnik Zemlya i volya, in that its members had come to believe that a social revolution would be impossible in the absence of a political revolution; the peasantry could not take possession of the land as long as the government remained autocratic. One response to this repression was the formation of Russia's first organized revolutionary party, Narodnaya Volya ("People's Will"), in June 1879. It favored the use secret society-led terrorism as an attempt to violently destabilize the Russian Empire and provide a focus for popular discontent against it for an insurrection, justified “as a means of exerting pressure on the government for reform, as the spark that would ignite a vast peasant uprising, and as the inevitable response to the regime's use of violence against the revolutionaries”. 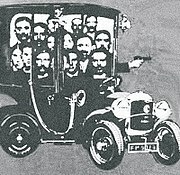 The group developed ideas—such as targeted killing of the 'leaders of oppression'—that were to become the hallmark of subsequent violence by small non-state groups, and they were convinced that the developing technologies of the age—such as the invention of dynamite, which they were the first anarchist group to make widespread use of—enabled them to strike directly and with discrimination. Much of the organization's philosophy was inspired by Sergei Nechayev and "propaganda by the deed" theorist Carlo Pisacane. The attempt to get the peasantry to overthrow the Tsar proved unsuccessful, due to the peasantry's idolisation of the latter as someone "on their side". Narodism therefore developed the practice of terrorism: the peasantry, they believed, had to be shown that the Tsar was not supernatural, and could be killed. This theory, called "direct struggle", intended "uninterrupted demonstration of the possibility of struggling against the government, in this manner lifting the revolutionary spirit of the people and its faith in the success of the cause, and organising those capable of fighting". On March 1, 1881, they succeeded in assassinating Alexander II. This act backfired on a political level, because the peasantry were generally horrified by the murder, and the government had many Narodnaya Volya leaders hanged, leaving the group unorganized and ineffective. After Peter Kropotkin along with others decided to enter labor unions after their initial reservations, there remained "the anti-syndicalist anarchist-communists, who in France were grouped around Sebastien Faure's Le Libertaire. From 1905 onwards, the Russian counterparts of these anti-syndicalist anarchist-communists become partisans of economic terrorism and illegal 'expropriations'." Illegalism as a practice emerged and within it "The acts of the anarchist bombers and assassins ("propaganda by the deed") and the anarchist burglars ("individual reappropriation") expressed their desperation and their personal, violent rejection of an intolerable society. Moreover, they were clearly meant to be exemplary, invitations to revolt." In late April 1919, at least 36 booby trap dynamite-filled bombs were mailed to a cross-section of prominent politicians and appointees, including the Attorney General of the United States, as well as justice officials, newspaper editors and businessmen, including John D. Rockefeller. Among all the bombs addressed to high-level officials, one bomb was addressed to the home of a Department of Justice Bureau of Investigation (BOI) field agent once tasked with investigating the Galleanists, Rayme Weston Finch, who in 1918 had arrested two prominent Galleanists while leading a police raid on the offices of their publication Cronaca Sovversiva. Such acts of rebellion, which could be individual were in the long run seen as act of rebellion, which could ignite en masse insurrection leading to revolution. Proponents and activists of these tactics among others included Johann Most, Luigi Galleani, Victor Serge, and Severino Di Giovanni. "In Argentina, these tendencies flourished at the end of the 20s and during the 30s, years of acute repression and of flinching of the once powerful workers movement –this was a desperate, though heroic, of a decadent movement." The Italian Giuseppe Ciancabilla (1872–1904) wrote in "Against organization" that "we don't want tactical programs, and consequently we don't want organization. Having established the aim, the goal to which we hold, we leave every anarchist free to choose from the means that his sense, his education, his temperament, his fighting spirit suggest to him as best. We don't form fixed programs and we don't form small or great parties. But we come together spontaneously, and not with permanent criteria, according to momentary affinities for a specific purpose, and we constantly change these groups as soon as the purpose for which we had associated ceases to be, and other aims and needs arise and develop in us and push us to seek new collaborators, people who think as we do in the specific circumstance." Nevertheless, he also says "We do not oppose the organizers. They will continue, if they like, in their tactic. If, as I think, it will not do any great good, it will not do any great harm either. But it seems to me that they have writhed throwing their cry of alarm and blacklisting us either as savages or as theoretical dreamers." An article by eco-anarchist magazine Do or Die manifests that "This is a debate that has gone on and still goes on within the insurrectionary anarchist circles; Renzo Novatore stood for individual revolt, Errico Malatesta for social struggle, whilst Luigi Galleani believed there was no contradiction between the two." A resurgence of such ideas for Joe Black happened "in the peculiar conditions of post war Italy and Greece". "Towards the end of World War II there was a real possibility of revolution in both countries." "Greece was to suffer decades of military dictatorship while in Italy the Communist Party continued to hold back struggles. Insurrectionalism was one of a number of new socialist ideologies which arose to address these particular circumstances." In Italy a tendency that did not identify either with the more classical Italian Anarchist Federation or with the platformist inclined (GAAP Anarchist Groups of Proletarian Action) started to emerge as local groups. These groups emphasized direct action, informal affinity groups and expropriation for financing anarchist activity. From within these groups the influential Italian insurrectionary anarchist Alfredo Maria Bonanno will emerge influenced by the practice of the Spanish exiled anarchist Josep Lluís i Facerias. Protester facing riot police in the "Battle of Seattle"
One insurrectionalist has described how the ideas spread from Italy: "Insurrectionary anarchism has been developing in the English language anarchist movement since the 1980s, thanks to translations and writings by Jean Weir in her Elephant Editions and her magazine Insurrection.... In Vancouver, Canada, local comrades involved in the Anarchist Black Cross, the local anarchist social center, and the magazines No Picnic and Endless Struggle were influenced by Jean's projects, and this carried over into the always developing practice of insurrectionary anarchists in this region today ... The anarchist magazine Demolition Derby in Montreal also covered some insurrectionary anarchist news back in the day." Insurrectionalist ideas also spread to the New Left movement in the United States, often being present in various revolutionary terrorist organizations, such as the Weathermen, Black Liberation Army, and M19CO. Weathermen leader Bernardine Dohrn argued for violence, saying: "We've known that our job is to lead white kids into armed revolution. We never intended to spend the next five to twenty-five years of our lives in jail. Ever since SDS became revolutionary, we've been trying to show how it is possible to overcome frustration and impotence that comes from trying to reform this system. Kids know the lines are drawn: revolution is touching all of our lives. Tens of thousands have learned that protest and marches don't do it. Revolutionary violence is the only way." Magazine Do or Die reports that "Much of the Italian insurrectionary anarchist critique of the movements of the '70s focused on the forms of organisation that shaped the forces of struggle and out of this a more developed idea of informal organisation grew. A critique of the authoritarian organisations of the '70s, whose members often believed they were in a privileged position to struggle as compared to the proletariat as a whole, was further refined in the struggles of the '80s, such as the early 1980s struggle against a military base that was to house nuclear weapons in Comiso, Sicily. Anarchists were very active in that struggle, which was organised into self-managed leagues." Later in 1993 the Italian insurrectionary anarchist Alfredo Bonanno writes For An Anti-authoritarian Insurrectionalist International in which he proposes coordination between mediterranean insurrectionists after the period of the dissolution of the Soviet Union and civil war in the ex-Yugoslavia. For Joe Black "That insurrectionalism should emerge as a more distinct trend in English language anarchism at this point in time should be no surprise. The massive boost anarchism received from the summit protest movement was in part due to the high visibility of black bloc style tactics." In the USA Feral Faun (later writing as Wolfi Landstreicher and Apio Ludd) gained notoriety as he wrote articles that appeared in the post-left anarchy magazine Anarchy: A Journal of Desire Armed. Feral Faun wrote in 1995, "In the game of insurgence—a lived guerilla war game—it is strategically necessary to use identities and roles. Unfortunately, the context of social relationships gives these roles and identities the power to define the individual who attempts to use them. So I, Feral Faun, became [...] an anarchist [...] a writer [...] a Stirner-influenced, post-situationist, anti-civilization theorist [...] if not in my own eyes, at least in the eyes of most people who've read my writings." Also Wolfi Lanstreicher has translated works by Alfredo Maria Bonnanno and other similar writers such as the early 20th century Italian illegalist anarchists Renzo Novatore and Bruno Filippi as well as other insurrectionist texts. This shows how more recent theories have taken relevance within insurrectionary anarchist theory along the egoist anarchism of Max Stirner. This contemporary approach has relevance in other place such as Chile where in 2008 after a few incidents of bombs claimed by anarchist groups a group called Frente Anarquista Revolucionario (Anarchist Revolutionary Front) after correcting what they see as misunderstandings of their position they wrote in the same pamphlet how they have been influenced by the "postmodernists texts of Alfredo Bonnano, Wolfi Landstreicher, etc, as well as other insurrectionary anonymous texts". As was mentioned before, insurrectionary anarchist discourse also had relevance in Greece. In the 2008 Greek riots the old disputes between organizationalist and insurrectionary anarchists reappeared when there was a conflict "between insurrectionary anarchists associated with the Black Bloc, and the heavily organized Antiauthoritarian Movement (AK, in Greek) ... the schism between insurrectionists and the Antiauthoritarian Movement has even led to physical fighting.... People with AK bullied and beat up anarchists whom they suspected of stealing some computers from the university during an event AK organized, getting them in trouble. In response, some insurrectionists burned down the Antiauthoritarian Movement's offices in Thessaloniki." The Informal Anarchist Federation (not to be confused with the synthesist Italian Anarchist Federation also FAI ) is an Italian insurrectionary anarchist organization. It has been described by Italian intelligence sources as a "horizontal" structure of various anarchist terrorist groups, united in their beliefs in revolutionary armed action. In 2003, the group claimed responsibility for a bomb campaign targeting several European Union institutions. In 2010, Italy's postal service intercepted a threatening letter containing a bullet addressed to Prime Minister Silvio Berlusconi. A large envelope containing a letter addressed to Berlusconi with the threat "you will end up like a rat" was discovered on Friday in a post office in the Libate suburb of the northern city of Milan. On 23 December 2010, credit for exploding parcels delivered to the Swiss and Chilean embassies in Rome was claimed by the Informal Anarchist Federation,. During the first years of the 2000s, the Iberian Federation of Libertarian Youth in Spain started to evolve towards insurrectionary anarchist positions and its differences with anarcho-syndicalism became more evident due to the influence of the Black bloc in alterglobalization protests and the examples of developments from Italy and Greece. The FIJL faced repression from the state, which led to inactivity A new generation of anarchist youth decided to establish a new FIJL in 2006. It tried to establish a clear difference with the other insurrectionist FIJL while defending anarcho-syndicalism critically. In 2007 it re-established itself as the FIJL since it did not have news from the other insurrectionist organization, but after finding out of a communique by the insurrectionist organization it decided to name itself "Iberian Federation of Anarchist Youth" (spa: Federación Ibérica de Juventudes Anarquistas or FIJA) but knowing that they are the continuing organization to the previous FIJL from the 1990s. They publish a newspaper called El Fuelle. In march of 2012 the FIJL of insurrectionist tendencies decides to not continue and so the FIJA goes to call itself again FIJL. A few main points can be identified within contemporary insurrectionary anarchism that go back to tactics employed by illegalism and propaganda by the deed anarchists. 1. "The concept of 'attack' is at the heart of the insurrectionist ideology." As such it is viewed that "It is through acting and learning to act, not propaganda, that we will open the path to insurrection." although "propaganda has a role in clarifying how to act." In the state of action is in the state that one learns. The Italian text Ai ferri corti says: "An individual with a passion for social upheaval and a 'personal' vision of the class clash wants to do something immediately. If he or she analyses the transformation of capital and the State it is in order to attack them, certainly not so as to be able to go to sleep with clearer ideas." "Attack is the refusal of mediation, pacification, sacrifice, accommodation, and compromise in struggle." 2. Insurrection(s) and Revolution: Revolution is seen as "a concrete event, it must be built daily through more modest attempts which do not have all the liberating characteristics of the social revolution in the true sense. These more modest attempts are insurrections. In them the uprising of the most exploited and excluded of society and the most politically sensitized minority opens the way to the possible involvement of increasingly wider strata of exploited on a flux of rebellion which could lead to revolution." 3. "The self-management of struggle" as "those that struggle are autonomous in their decisions and actions; this is the opposite of an organization of synthesis which always attempts to take control of struggle. Struggles that are synthesized within a single controlling organization are easily integrated into the power structure of present society. Self-organized struggles are by nature uncontrollable when they are spread across the social terrain." It is seen that the system and its institutions are afraid of rebellious acts becoming propaganda by the deed and thus making rebellion extend itself. "Small actions, therefore, easily reproducible, requiring unsophisticated means that are available to all, are by their very simplicity and spontaneity uncontrollable." This also means that insurrectionary anarchists should not see themselves as a vanguard or as the conscious ones but just as part "of the exploited and excluded". 4. Temporary affinity groups instead of permanent organizations: This means rejection of "thus we are against the party, syndicate and permanent organization, all of which act to synthesize struggle and become elements of integration for capital and the state." Instead the view that "organization is for concrete tasks". "The informal anarchist organization is therefore a specific organization which gathers around a common affinity." 5. The transcendence of the dichotomy between the individual and the rest of society and of individualism and communism: "Insurrection begins with the desire of individuals to break out of constrained and controlled circumstances, the desire to reappropriate the capacity to create one's own life as one sees fit." But the view that "Individuality can only flourish where equality of access to the conditions of existence is the social reality. This equality of access is communism; what individuals do with that access is up to them and those around them. Thus there is no equality or identity of individuals implied in true communism." Insurrectionary anarchists often identify with differing theoretical positions within the anarchist spectrum. ^ a b c d e f g h i j k l m n o p q r "Some Notes on Insurrectionary Anarchism"
^ a b c d e f g h i j "A-Infos (en) Ireland, Red & Black Revolution #11 - Anarchism, insurrections and insurrectionalism by Joe Black - WSM". Archived from the original on 6 December 2010. Retrieved 15 December 2015. ^ Allan Antliff. "Anarchy, Power, and Poststructuralism". The Anarchist Library. 'The insurgent', wrote Stirner, 'strives to be constitutionless', a formulation that the program of the Moscow Federation put into practice. Autonomous self-governance, voluntary federation, the spread of power horizontally — these were the features of its insurgency." ^ "Max Stirner". Archived from the original on 30 July 2016. Retrieved 11 January 2011. ^ a b c "Insurrectionary Anarchy: Organising for Attack! " by Do or Die Issue 10. pp. 258–266. ^ "Anarchism and violence - Propaganda By Deed". Retrieved 11 August 2015. ^ a b Doug Imrie. "The Illegalists". Archived from the original on 8 September 2015. Retrieved 11 August 2015. ^ a b "Vivir la Anarquía: Artículo en solidaridad con Alfredo Bonanno y Crhistos (sic) Stratigopoulos" [Long Live Anarchy. Article in solidarity with Alfredo Bonanno and Crhistos Stratigopoulos] (in Spanish). Hommodolars Contrainformacion. 31 October 2009. Archived from the original on 28 August 2015. Retrieved 11 August 2015. ^ Alfredo M. Bonanno (1993). "For An Anti-authoritarian Insurrectionalist International". Retrieved 11 August 2015. ^ "Feral Revolution and other essays". Retrieved 11 August 2015. ^ "mahost.org". Archived from the original on 5 May 2015. Retrieved 11 August 2015. ^ Bruno Filippi. "The rebel's dark laughter: the writings of Bruno Filippi". Retrieved 11 August 2015. ^ "mahost.org". Archived from the original on 9 September 2015. Retrieved 11 August 2015. ^ Michele Fabiani (17 August 2008). "Critica individualista anarchica alla modernità" [Individualist anarchist critique of modernity] (in Italian). Anarchaos.org. Archived from the original on 8 March 2012. ^ "Terrorist Organization Profile: Informal Anarchist Federation". START – National Consortium for the Study of Terrorism and Responses to Terrorism. Retrieved 11 August 2015. ^ "Threatening letter with bullet sent to Berlusconi". Archived from the original on 13 May 2011. Retrieved 17 January 2011. ^ "Rome embassy blasts wound 2; anarchists suspected". Boston.com. Retrieved July 18, 2017. ^ a b "Comunicado de la Federación Ibérica de Juventudes Libertarias (FIJL)". Retrieved 11 August 2015. ^ "Comunicado de disolución de la Federación Ibérica de Juventudes Libertarias (FIJL)". Retrieved 11 August 2015. ^ "At Daggers Drawn with the Existent, its Defenders and its False Critics". Retrieved 11 August 2015. Some Notes on Insurrectionary Anarchism by Sasha K, originally published in Killing King Abacus in Santa Cruz, California. "Fire At Midnight Destruction At Dawn" by Kasimere Bran, originally published in the first issue of A Murder of Crows. This page was last edited on 2 March 2019, at 13:08 (UTC).